← Oh right, the gift reveal. Ordered two books and I’m so excited about them. 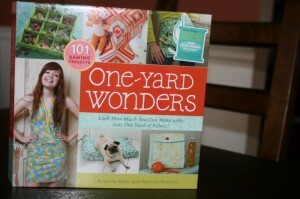 One Yard Wonders is amazing! I can’t decide where to start!! Bend the Rules with Sewing, I suppose the book I should have gotten first, is really neat too. I’m such a sucker for bags and totes and between these 2 books there are so many to choose from. I also managed to sneak out to the thrift store on the weekend and found that neat little pineapple napkin holder. I thought it might hold some of my newly acquired craft and sewing books nicely. Seems it’s a perfect fit for my Amy Karol collection. 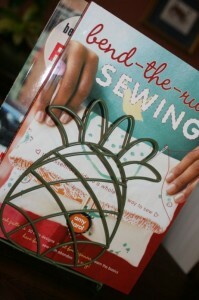 This entry was posted in sewing and tagged amy karol, books, fabric, sewing. Bookmark the permalink.